For some of my video clips of the traffic ladies, please click here , here , here and here . 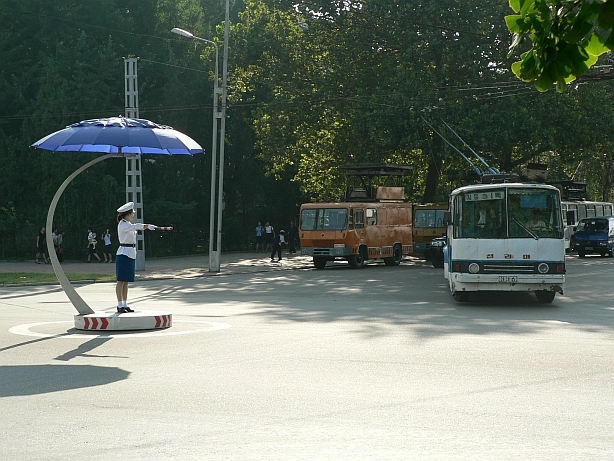 One of Pyongyang's signature attractions, the ubiquitous traffic ladies. 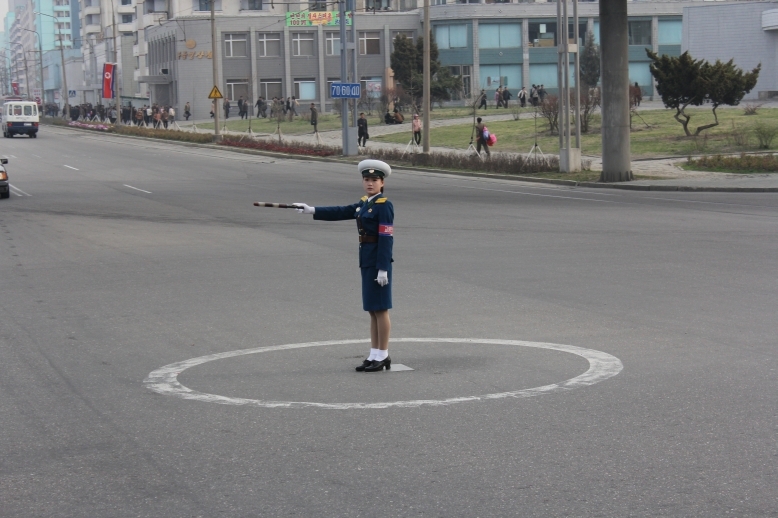 Instead of relying on stoplights (when the power supply is never assured), each major city intersection features one of these smartly dressed ladies executing stiff military moves as they guide traffic in all directions. Officially they are considered police, and photographs of police (or any other persons of paramilitary designation) are strictly prohibited. 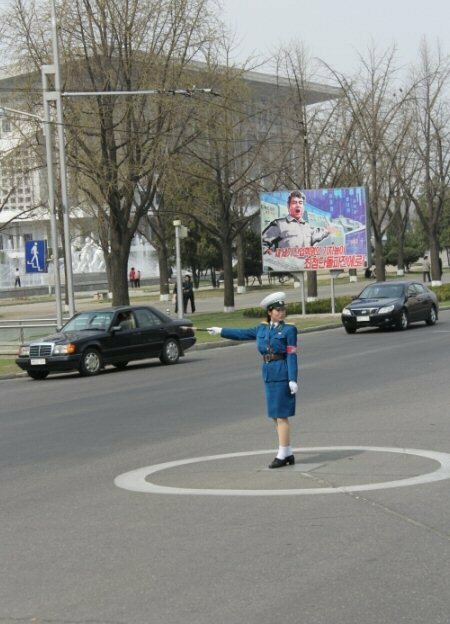 That being said, Pyongyang tour guides are proud of their traffic ladies and the beauty and grace they are known for, so oftentimes they will look the other way when tourists break out their cameras. 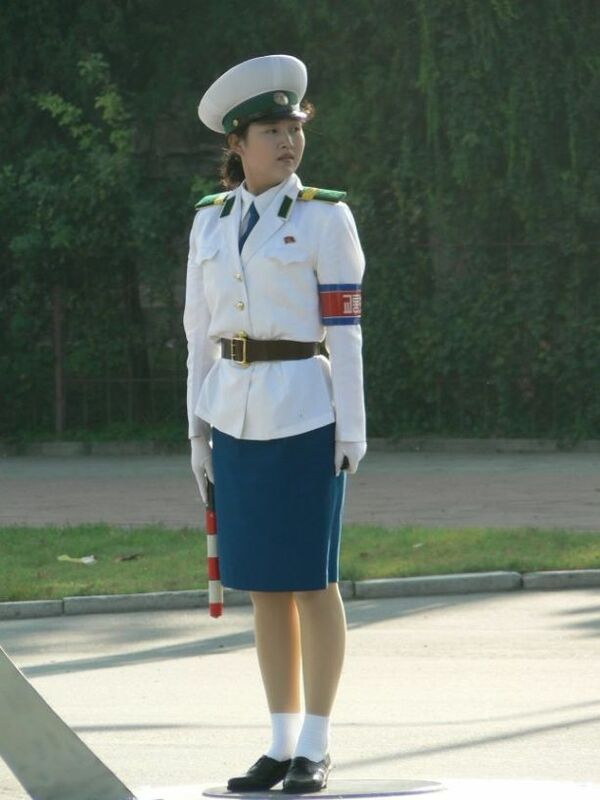 In the three times I've been to North Korea, I've been exposed to every attitude from a shrill "no pictures!" to a tour bus actually pulling over so that we could freely photograph them. 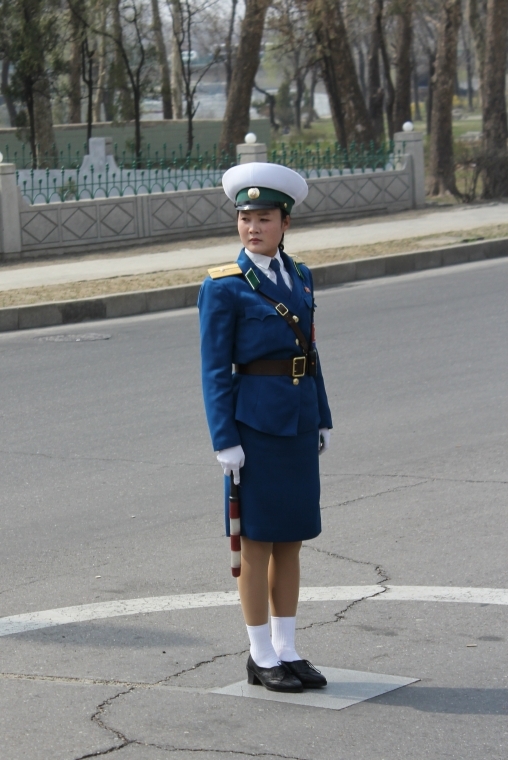 Uniforms are changed with the seasons; in the colder months of the year a dark blue is worn, white is worn in the hotter months when the ladies often stand under umbrellas for extra protection from the summer sun. "The number of gestures greatly exceeds the number of cars." -- astute comment by Hobu123 on one of my youtube video reviews. 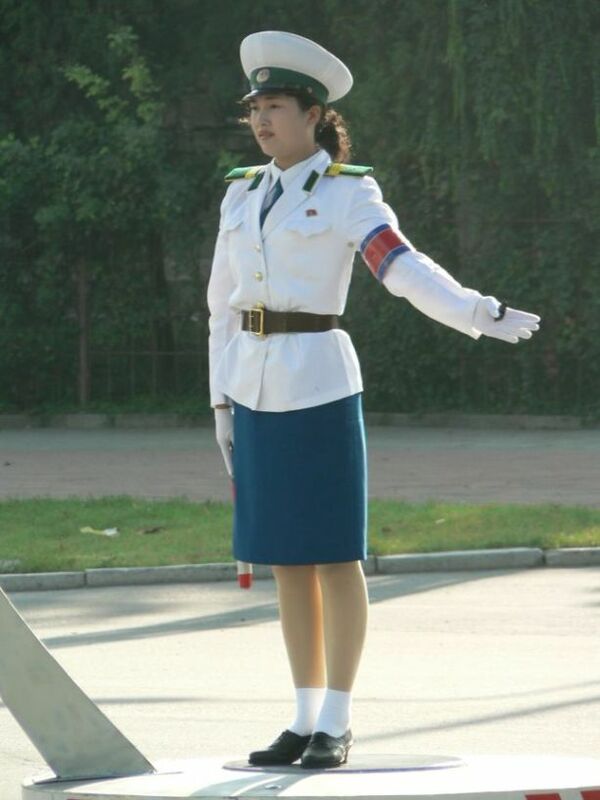 The photographs of the traffic lady below were taken in 2009 at the corner of Sungri ("Victory") and Potongmun Streets. In the background is one of the many signs we saw throughout the city about the current "150 Day Battle" imploring North Koreans to work harder to boost the DPRK economy. "Let's move forward on a brave horse!" proclaims the banner. 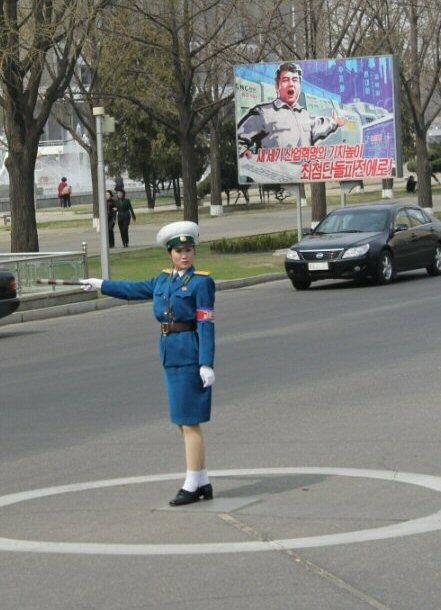 As luck would have it, almost exactly a year later I was standing on the same corner at the same intersection realizing the same lady was still there, guiding traffic (now with a different propaganda sign in the background). We even managed to coax a smile out of her this time around. 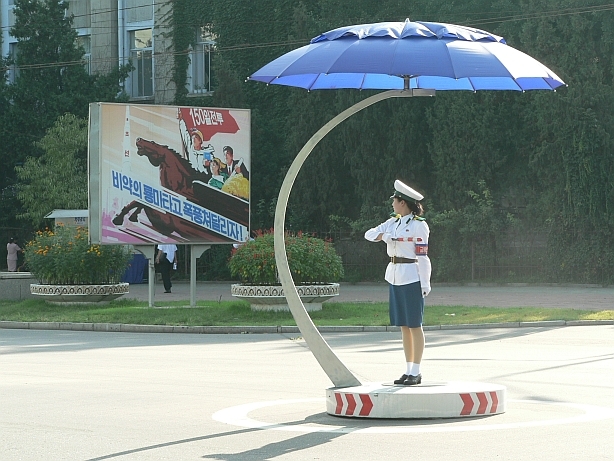 Traffic lady standing beside a giant roadside sign that says, "Highest glory to Kim Jong Eun." 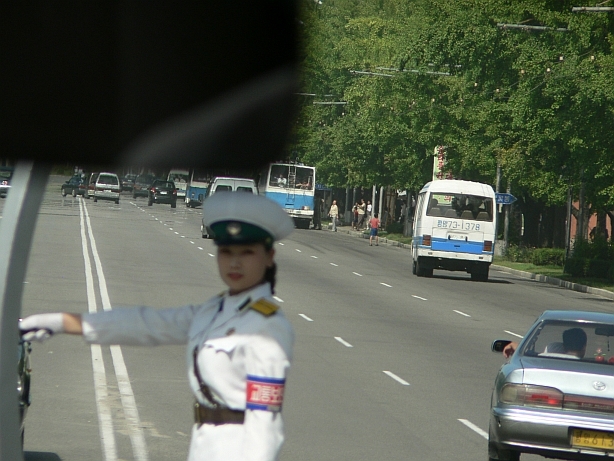 One wonders what will happen to these ladies if/when the day comes that Pyongyang's power problems are a thing of the past and an increasing amount of traffic necessitates more stoplights being put in place. Even now some of the ladies seem unsure of their roles at intersections with working traffic lights; they often stand on the side of the road with no visible purpose.